This wide-spectrum water filter has more filtration material than others, for better and longer filtration. Replace the cartridge just once a year to assure continued effective filtration across the spectrum. The water filter contains a full pound of pre-washed granulated carbon AND kdf AND 2 sediment filters. The flow rate is excellent. Unlike some types of filters, the water flows right through. Change your filter cartridge once a year. But there is more that makes this filter so good. The kdf in the cartridge has been processed using a patented method that greatly increases its effectiveness. With this Foam Advantage, contact between the water and the filter material is greatly increased. That is how filtration happens. So you get more kdf filtration even though a smaller part of the cartridge is used for kdf. That leaves more room for more granulated coconut carbon, further increasing the level of filtration. Water filter with sediment filters, kdf and pre-washed granulated coconut carbon for best filtration. The cartridge in this filter uses the great combination of copper-zinc kdf and granulated coconut shell carbon, for the best-of-all-worlds filtering. Carbon lasts much longer in combination with kdf, and the filtered water is more natural. Bacteria cannot grow in the carbon because of the copper-zinc. 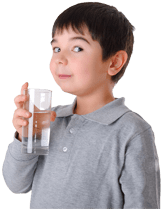 This filter is effective on chlorine, chlorination byproducts, chemical contaminants, organic contaminants, sediment, algae, molds, scale, bad taste, odors and hundreds of contaminants. The most recent improvement is the wide-spectrum cartridge we include is the KR-101A, which does all that the standard wide-spectrum does, plus it removes plastic microfibers from the water. Microfibers have been shown to be a common problem. Links to the Single Canister Wide-spectrum Kitchen Filter: Under-the-sink. Countertop. Change the filter cartridges once a year. To learn more: Water Filters . To see a list of contaminants filtered, see What Is Filtered? . Under-counter filters need to be installed by someone who knows plumbing. If you are uncertain, call a plumber. It normally takes about a half-hour.